Wombats are one of Australia’s least understood marsupials and humans are their greatest enemy. Not many people have seen a wombat in the wild. Destruction of their habitat, hunting, trapping, poisoning have all severely reduced the wombat populations. In South Australia, the Wombat Awareness Organisation has been fighting for the plight of the Southern Hairy-nosed Wombat. Striving to conserve this precious little Aussie, WAO presented to Parliament highlighting the mishandling of destruction permits, illegal culling and WAO’s proposed movement to change the Code of Practice for the Humane Destruction of Wombat pouch young via decapitation. Recent events of nature have justified our concerns for the longevity of the species. Battling for survival through a long and devastating drought, the debilitating disease Sarcoptic mange and the increase of culling, the wombats of South Australia have been struck by floods. Common Wombats are a protected species in Victoria, except in the 193 Parishes where farmer can kill wombats without the need to obtain a permit. East of the Hume Highway, ( the main distribution of wombats) Common Wombats have been declared unprotected wildlife. Victorians should be ashamed of the way wombats are allowed to be treated. The common wombat is widespread in the cooler, wetter parts of southern and eastern Australia. A stronghold is in the Wombat and Macedon Ranges forests (Western Victoria), where they are protected wildlife. However, permits can still be obtained for their control. Permits to kill thousands of native animals, including black swans, kookaburras and more than 1500 wombats were issued by Victoria’s Department of Sustainability and the Environment last year 2011. EPBC Act status: listed as vulnerable due to agriculture and aquaculture: Land clearing, habitat fragmentation and/or habitat degradation. Northern Hairy-nosed Wombat (Lasiorhinus krefftii) would have to be considered to be on the brink of extinction. Threats: habitat loss and change, drought and competition with cattle, sheep and rabbits for food have contributed to the decline of the Northern Hairy-nosed Wombat. Threats: Mange is prevalent throughout most of the Bare nosed wombat’s range, and is considered by some as the number one cause of death. Wombats are more susceptible to mange when they are under stress or undernourished. A Southern Hairy-nosed wombat – an endangered burrowing marsupial from South and Western Australia – was been sighted for the first time in Victoria in 2010. Before this, the only known populations of Southern Hairy-nosed wombats were in South Australia and small pockets in New South Wales. Southern hairy-nosed wombats are similar in size to their bare-nosed counterparts, but have softer grey fur, longer ears and a broader nose. Critically endangered Northern hairy-nosed wombat which can only be found in one small area in outback Queensland. Major threats include roadkill and injury, predator attack, habitat loss and urban development, burrow destruction and the debilitating infestation, Sarcoptic mange. Bare-nosed wombat All Bare-nosed or Common wombats are generally considered a single species, Vombatus ursinus; however, they are sometimes classified as separate species or subspecies depending on where they live. The Bare-nosed wombat is unprotected in Victoria. The Bare-nosed wombats on Flinders Island are classified as vulnerable. Wombats fall prey to dingoes, foxes, Tasmanian devils (in Tasmania), dog attacks and many become road kill. Young wombats may be taken by eagles, owls and eastern quolls. Wombat tunnels are an amazing feat of engineering and can measure anything from 2 to 20 meters in length with various connecting and sub tunnel branches. A Wombat may have a minor tunnel just for emergency escapes and also a major burrow set-up with sleeping quarters and two or three entrances. Normally only one wombat lives in a burrow for they are solitary animals and they mark their land by dropping scats so they can be seen by other Wombats. AWPC believes that all common native animals deserve better treatment than they are often afforded. We recognise that wombats should have rights to protection, and that their quality of life and habitat preservation are the responsibility of all Australians and government departments. Ad hoc laws throughout Australia allow the States and Territories determine their own laws regarding wombats. Such laws are inconsistent, lack a basis of substantive scientific research and allow inhumane methods of destruction. Mange is widespread throughout all populations of Wombats in Australia with the exception of the Northern Hairy Nose Wombat which currently remains unaffected; they have enough problems as it is. Mange left untreated causes Wombats to die, often a long and drawn out death. Mange in Wombats is caused by the sarcoptes scabiei mite, the same species of mite that causes scabies in humans and mange in dogs and a variety of other animals.. Two varieties of the mite are known, one a canine and the other primate subspecies. While var.wombatis is often used to describe mites found on Wombats, these mites have not been identified as a separate subspecies. It is possible from anecdotal evidence that wombats are affected by both sub species. The female mite buries into the skin and deposits eggs in tunnels under the skin. Males and nymphal stages remain on the outside of the animal or person. The female mite is reported to live a maximum period of five weeks within the skin then she dies. Wombats may be seen out in the daytime or behaving oddly going near dogs or domestic stock or are found in sheds and under houses. The Wombat seen this way is often covered in thick scabs caused by the female mite burrowing into the skin. The scabby plaques that form often crack causing deep chasms in the skin which bleed and become flyblown particularly in summer. The Wombat can be so severely affected by resulting infections that it smells and its movements are accompanied by swarms of flies in summer. Mites burying in near the conjunctiva of the eye and the soft tissues of the nose and ears render the wombat fairly unresponsive to most things. Wombats are often considered blind (because they are out in the daytime) but unless the eye has been permanently damaged it is the scab encrusting the eye that causes blindness. This has been reported to reverse when the infestation resolves. Electric fencing: Two electric wires placed at 15cm and 30cm above the ground approximately 30cm outside of an existing fence can prevent access by wombats. Fence alterations: In cropping areas, where containing stock is not an issue, remove the bottom fencing wire (the wire that is 15cm above the ground) to allow free movement of wombats and to prevent them from digging under the fence. Wombat gates: Damage to fencing may occur when wombats move between warren and foraging sites. ‘Wombat gates’ can be installed to allow the animals to move freely through a fence without damaging it. 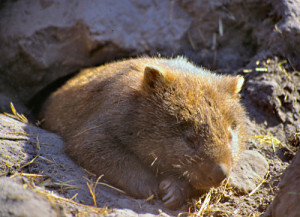 Remove access to harbour sites: Some wombats may utilise spaces underneath houses or other farm buildings. Access to these areas can be prevented through the installation of heavy gauge mesh or a buried wire apron.